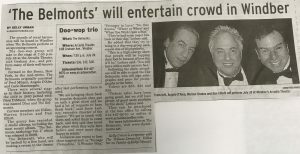 Tribune-Democrat Highlights The Belmonts Show! Check out the latest article in today’s Tribune-Democrat, July 19th. It talks about our upcoming show -“The Belmonts” who will be performing next Saturday, July 28th at 7:30 pm. http://arcadiawindber.com/wp-content/uploads/2018/07/Dion-and-the-Belmonts-II-2.jpg 65 306 Windber Arcadia Windber Arcadia2018-07-19 17:56:232018-07-19 17:59:00Tribune-Democrat Highlights The Belmonts Show! The Belmonts will be arriving soon…… Tickets for Hotel California Are Flying Out the Door!